Join the discussion on our forums! 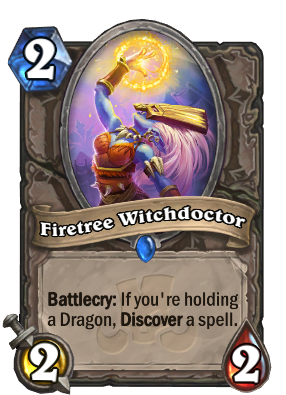 Come discuss Firetree Witchdoctor over in our dedicated Firetree Witchdoctor discussion topic. I love this card! Really good! One of those cards that have their name not relate to the effect. Finally, neutral dragon synergy cards! This one is one of the best (durring revel) so far. -Discover a spell. * Would be 1 mana ( Babbling Book is a Wisp with the same effect), already worth 2.5 mana, making it efficient. Comparing to Babbling Book is wrong because that's random and this is discover. Yeah true, what was I thinking lol. Edited that one. I wrote that at like 3 AM; don't know what drove me to such insane logic. I originaly thought "It's a Discover X Spell on a stick; those are usually 1 mana." and the mana cost fit perfectly! It's a new cheap value engine. -2/2 = 4 stats. Worth 1.5 mana (vanilla 2-drop has 5 Stats), so the effect has to be worth at least 0.5 mana to be fair. -Discover a spell. * Would be 1 mana ( Babbling Book is a Wisp with the same effect Edit: It is not a good example because it is random; better comparison would be Hallucination for the effect; Netherspite Historian as a minion with discover X). Since you bundle 2 cards together, your card draw becomes much more efficient; so you could put a 0,5 mana tax on that too. -*If you hold a dragon. This condition usually discounts about 0,5 to 1 mana. Servant of Kalimos and Primalfin Lookout; both have vanilla stats for a minion worth 1 mana less, discover a card on top and have a conditon to be fullfilled as a downside to justify the effect. You could also compare this to Netherspite Historian; which has similar stats and a dragon condition discover. Spells are usually much quicker and allow you to answer a boardstate quickly. Will fit in every dragon based deck so pretty versatile troll right here. I like it!